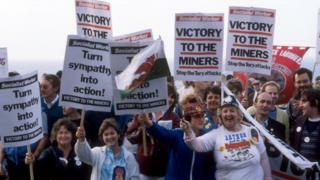 Image caption Miners and miners' wives demonstrate at the TUC Conference at Brighton in 1984. Amber Rudd's decision not to hold an inquiry into the "battle of Orgreave" has prompted anger from campaigners - and the re-running of many of the arguments around the 1984/85 miners' strike. A day after the home secretary gave a statement to MPs, Policing Minister Brandon Lewis was brought to the chamber to answer a question from Labour MP Andy Burnham. It offered Welsh MPs a chance to share their take of a strike that appears as bitterly divisive now as it did then with MPs from either side of the chamber lining up along partisan lines. Monmouth Tory MP David Davies asked Mr Lewis if he agreed "that far and away the worst atrocity in those terrible events was the murder of the taxi driver, David Wilkie?" "Are you as amazed as I am that his death has not been mentioned once by opposition members? Do you agree that if we are to have a public inquiry, it should be into what the former leader of the Labour Party called the lies, the violence and the lack of a ballot by those strike-breakers?" Mr Lewis offered a diplomatic reply: "You highlight the strength of feeling that exists on all sides of the debate about the activities that happened many years ago. On the point you raised about what would happen if there were a public inquiry, there will not be one. The decision of the home secretary and the government is that the wider public interest is not served by having an Orgreave inquiry." Ann Clwyd was elected MP for Cynon Valley during the strike. She told MPs: "I spoke about the strike in my maiden speech, and I stood on the picket lines and saw what happened. "I saw the brutality and the intimidation. I saw a pregnant woman kicked in the stomach. There was a lot of violence. That was in the Cynon valley, and people in the Cynon Valley still feel very strongly about this issue. They believe that unless the government have something to hide, they should agree to an inquiry. We are fully behind the people who call for the inquiry: people never forget, and certainly they will never forget the experiences of the miners strike." Mr Lewis repeated the argument for not having an inquiry. Rhondda MP Chris Bryant tried again: "The miners from the Rhondda at Orgreave were dressed in T-shirts and plimsolls, and they were batted aside like flies by what felt like a paramilitary operation under political instruction. "There are very real questions that the community in the Rhondda is still asking. Who gave those instructions? Has the present Home Secretary seen the operational instructions of the day? Why will she not publish them? Who told the police officers to fabricate evidence and to perjure themselves? The home secretary says that there has been no miscarriage of justice, but the people of the Rhondda will conclude that without a proper investigation and full publication, the miscarriage of justice is being done in this House by this government." Mr Lewis said that although a comparison had been made with Hillsborough "there were no deaths or wrongful convictions as a result of Orgreave". He said policing had changed dramatically, a point echoed by Gower Conservative MP Byron Davies, who was a serving police officer during the strike. He asked Mr Lewis if he agreed "that policing has moved on significantly in the last few decades, that there are sufficient safeguards against a repetition of an episode like Orgreave, and that there is no useful purpose in an inquiry?" Unsurprisingly, the minister - who had rejected calls for an inquiry - agreed. In the Lords, former Labour leader Neil Kinnock said the government's decision would deepen "the justified sense of injustice" in coalfield communities. Lord Kinnock, who was party leader at the time of the miners' strike, said the government had promised to govern in the interests of the whole country and should ensure "maximum transparency and accountability for the whole country". He added: "Refusal of an inquiry into the battle of Orgreave deepens the justified sense of injustice right across coalfield communities, especially when there are substantiated claims that there was politicised policing and tampering with evidence in the wake of the conflict." Home Office minister Baroness Williams of Trafford defended the decision and denied that it was "politicised".